Energy efficient houses are often thought to be a promising way to reduce our environmental footprint by using less energy and producing fewer greenhouse gas emissions. Yet, surprisingly, if you consider the whole life cycle of a house, it turns out that sometimes a new home designed to save energy can end up using more than an average house. Our study, published in the December edition of the journalApplied Energy, found that current building regulations are failing to adequately address the broad scope of energy use associated with buildings. We need to start thinking about building materials, size, location and lifestyles - not just heating and cooling. In Australia, the star-rating scheme measures the energy efficiency of residential buildings on a scale of 1 to 10 stars, with 10 being extremely energy efficient and requiring very little energy for heating and cooling. The higher the star-rating, the more materials are typically required - such as for insulation, glazing, efficient window frames - in order to reduce heating and cooling energy demand. All these materials require energy to produce, known as their embodied energy. In a climate such as Melbourne's, a 6-star rated home would require 114 megajoules of energy per square metre each year for heating and cooling, which works out to be 27,360 megajoules a year for a typical new 240m² house. That's two-thirds less energy for heating and cooling than an average Melbourne home. If you go even further and achieve an 8-star rating, that falls to 54 megajoules per square metre - or 12,960 megajoules a year for a 240m² house. That's a good enough result to earn a"passive house" certification in Europe. However, we found that the additional embodied energy of the materials needed to achieve this improved performance would equate to at least 500,000 to 800,000 megajoules of energy for a new 240m² house, even before you moved in. That's equivalent to the energy you would need to heat and cool the home for 15 to 25 years. A house is not just a space to heat or cool: it's an organised assembly of numerous materials to produce indoor and outdoor spaces. Within these spaces, thermal comfort is required and energy is used to maintain it. Energy is also needed for lighting, appliances, cooking and hot water. At a larger scale, buildings form neighbourhoods, which in turn form cities. The type and layout of those buildings greatly influence travel distances and the associated energy needed for transport. Most new houses are built in the outer suburbs of our major cities, often with a lack of reliable public transport services, forcing householders to rely on cars for travelling long distances. This leads to a significant demand for transport-related energy, particularly petrol, especially compared to inner-city households. The total operational, embodied and transport energy associated with a super insulated house near Brussels, Belgium (equivalent to an 8 to 9-star house in Australia) was compared to the same house built to minimum requirements (6-star equivalent) and an apartment in the city (5-star equivalent). Four and two occupants were assumed to live in each of the houses and the city apartment, respectively. The occupants of both houses in the suburbs rely on cars for their mobility, while those in the city travel by trams, trains and car. Figure 1 compares the total energy use of the three buildings over 50 years, per person. 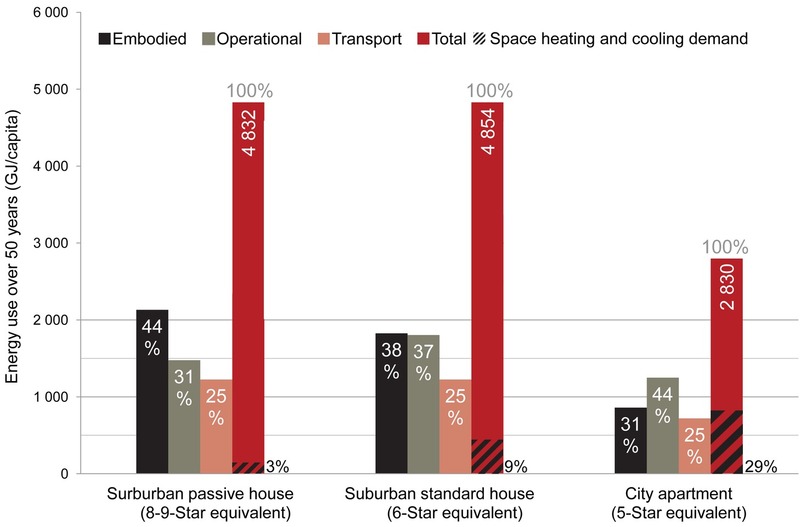 As can be seen above, the total energy use of the passive house (8 to 9-star equivalent) is only marginally less than that of the standard house, and 1.7 times higher than the city apartment.